We are happy to announce that the amazing dancers and instructors Jenny Sowden & Dan Repsch are coming to Dublin on the 26th and 27th May. Downtown Blues have been trying, for a while, to get these teachers here for you! Jenny & Dan are known for being mind opening and enlightening, you’re in for a dancing treat! This workshop will be focused in Blues Dance Aesthetic and Vocabulary with a bit of Blues History during the classes. Registrations will open on Sunday 6th May at noon, stay tuned for more details. This level is aimed for Beginner Blues dancers. If you have attended even one Blues class, this is your level. This is an all-levels class that works from the ground up. We’ll start with the foundations and fine-tune those all-important details, including posture, pulse and other elements that create blues aesthetic. No matter where you are in your dancing, you’ll take something new away from this class. We’ll start with creating a great embrace connection, and how to pass effortlessly between embrace and closed. Then we’ll share some vocabulary for this comfortable dance position that will sweep you across the floor. This level is aimed for dancers that are more experienced in their dance and have done some Blues courses / Workshops. 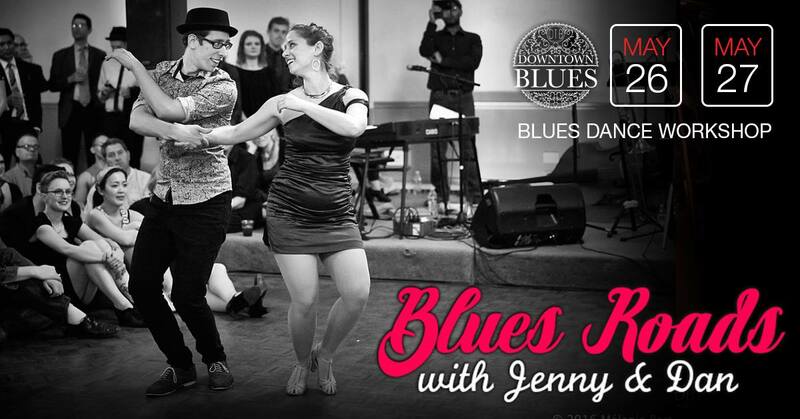 One year of regular blues dance classes are encouraged. Sometimes movements start with a rotation before the woosh! We'll refine the technique of creating a rotational stretch, then use that to create a few different movements. Chicago Blues: a style soaked in beer and raised in bars. We're going to use this music to find just what it brings out. Expect to refine an invitational lead and follow style, while exploring a range from powerful to laziness can play into your dance. Be ready to put an ear to rhythm. We will identify the key areas that will take your dance to the next level, and give you homework to walk away with while honing your Blues Aesthetic. This level is focused on more technical aspects of Blues dancing and dedicated to dancers that are teaching Blues Dance. The classes will include a pedagogical component. To apply for this level, contact us. How did they know I was going to do that?! Sometimes you sync so well with a partner that the connection seems telepathic. Jenny and Dan will share what they use to form this connection through musical choices, preps, and body language to make it feel like you and your partner are on the same brainwave. This level is focused on more technical aspects of Blues dancing and dedicated to dancers that are teaching Blues Dance. The classes will include a pedagogical component. To apply for this level, contact us. For this workshop you need to register with a partner. Teachers Level: to apply for this level, contact us. 14:00 - 15:00 -- Level 1 "Building Better Blues"
15:00 - 16:00 -- Level 1 "Effortless Embrace"
16:30 - 17:30 -- Level 2 "Round and Round"
Social Dancing from 8pm until 12pm - MyArt (Newmarket, Merchants Quay, Dublin 8). Note: This venue is not a bar, so you should bring your own drinks. Beer and wine are okay, but no spirits please. 11:00 - 12:00 -- Level 2 "Chicago Blues"
12:00 - 13:00 -- Level 2 "Movin’ On Up"
14:00 - 15:00 -- Teachers level "Determinate / Indeterminate"
15:00 - 16:00 -- Teachers level "Movin’ On Up"
16:30 - 17:30 -- Teachers level "Class focus on pedagogy"